The word xeriscape doesn’t mean zero landscaping. Rather, comes from the Greek word xeros, which means dry. 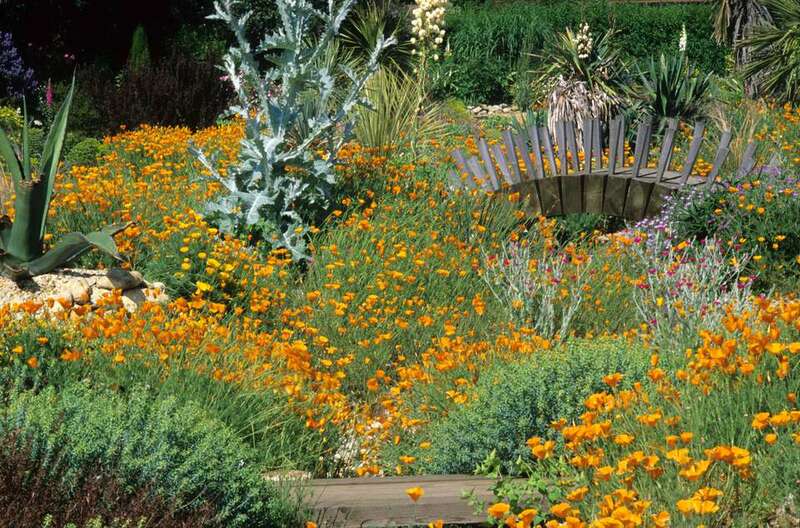 Flower gardeners may turn up their noses at the idea of xeriscaping, thinking they have to sacrifice color for cacti and ornamental grasses, but xeriscapes happen everywhere, not just in desert regions. The goal of a xeriscape is to rely only on the natural rainfall you receive for irrigation. Here are 10 flowers that can thrive in your landscape without supplemental watering. The African iris (Dietes iridioides) has the exotic appeal of an orchid, sporting large white flowers with purple and yellow markings. Divide irises every few years to keep them vigorous. Unlike bearded irises, this species is tender, growing in USDA zones 8 to 11. Also known as the fortnight lily, the African iris is a good addition to the xeriscape rock garden, as too much wood-based mulch can cause crown rot. Don’t confuse this bulletproof plant with the annual sweet alyssum. Perennial alyssum, also called basket of gold, is reliably hardy to USDA zone 3, forming a carpet of yellow flowers in the spring. The plants have a cascading habit that makes them attractive when you allow them to drape over a rock wall. The butterfly bush may introduce you to some butterfly species you didn’t even know you had in the garden, so great is its attraction to the nectar loving insect. The free form bushes die back to the ground in temperate regions, only to soar as high as 15 feet in the spring. The bushes never drop their spent flowers, making them tidy selections to grow beside walkways. The butterfly bush is a good choice for rural gardens, as browsing deer ignore the flowers. When spring flowers are starting to fade, poppies are just hitting their stride. This California state flower isn’t reliably hardy in areas with temperatures below 20 degrees, but poppies self-seed so freely that you’ll find yourself pulling them from the cracks in the driveway. You can preserve the ephemeral beauty of their vivid orange petals by pressing poppies for use in crafts. Evening primrose, or sundrop flower, falls into that tricky category of biennial plants, which many gardeners avoid because they don’t want to endure a season without blooms while waiting for the plant to mature. However, these night-bloomers self-sow readily, so there will always be a flowering generation present in the garden after the plants are established. Most gardeners treat lantana as an annual in the landscape, as it blackens at the first whiff of frost. The flower clusters, borne in shades of pink, magenta, yellow, and orange, are butterfly beacons throughout the growing season. Gardeners in frost-free areas should plant lantana judiciously, as it can take over a garden bed. This tough plant will grow happily beside a sun-baked driveway, displaying attractive grey leaves with yellow flowers like little pompoms in the springtime. Lavender cotton won’t tolerate rich soil or extra irrigation; it responds to pampering by putting out lanky growth and flopping onto the ground. Pruning maintains the mounded shape of the plant and rewards the gardener with a musky scent. The rugosa rose is a class apart from the hybrid tea rose and its finicky clan. The rugosa rose is popular with novices and organic gardeners, as it doesn’t require an extensive spray program to prevent pests and diseases. This rose can grow unprotected in zone 2, and it tolerates salt spray. The large rose hips of the rugosa rose give this shrub four seasons of interest in the landscape. Snow-in-summer is a vigorous choice for hillside gardens, forming a dense mat smothered with small white flowers in early summer. The profuse blossoms appear luminescent at night, making it a pleasing addition to the moon garden. The plant spreads so freely that you’ll be digging up clumps to share with friends or add to the container garden. Like many xeriscape flowering plants, yarrow features grayish-green foliage that makes it a good foil for pink or purple flowers. White yarrow is a wildflower that can take over a landscaped bed. Moonshine is a popular variety you can find at most garden centers, and the dense yellow flower umbels stand up well in cut flower arrangements.